Polymorphic Eruption of Pregnancy (PEP), also known as Pruritic Urticarial Papules and Plaques of Pregnancy (PUPPP), is a common benign dermatosis of pregnancy . Despite its frequency, it is highly under diagnosed. Its causes are still to be described, but it is thought to be associated with the distension of the abdominal wall and stretching of the subcutaneous tissue, thus its higher frequency in multiple pregnancies, macrossomia and hidramnios . It usually occurs during the third trimester when there is marked abdominal distension. Its exact pathophysiology remains unknown [3-5]. 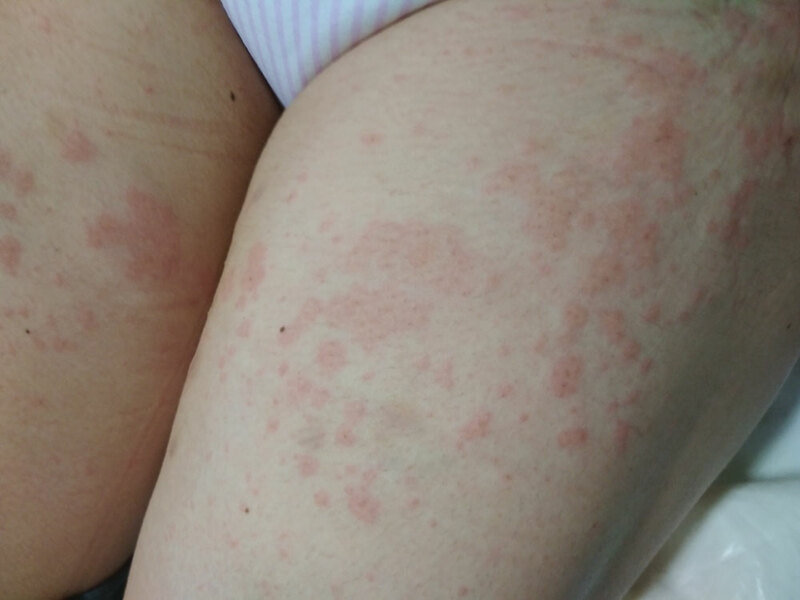 The main features are an intensely pruritic erythema, affecting the abdominal skin, proximal tights and arms - predominantly the striae; with coalescent papules forming plaques, with no blisters or umbilical involvement (as opposed to Pemphigoid Gestationis - PG) [6-8]. It has not been associated with poorer maternal or fetal outcomes. It is self-limited, usually within few days or weeks during pregnancy or soon after delivery. Treatment with daily topical mid-power steroids, sedative antihistamines and ointment is recommended . As a pregnancy associated entity, its appearance only after delivery is extremely rare [1,10]. 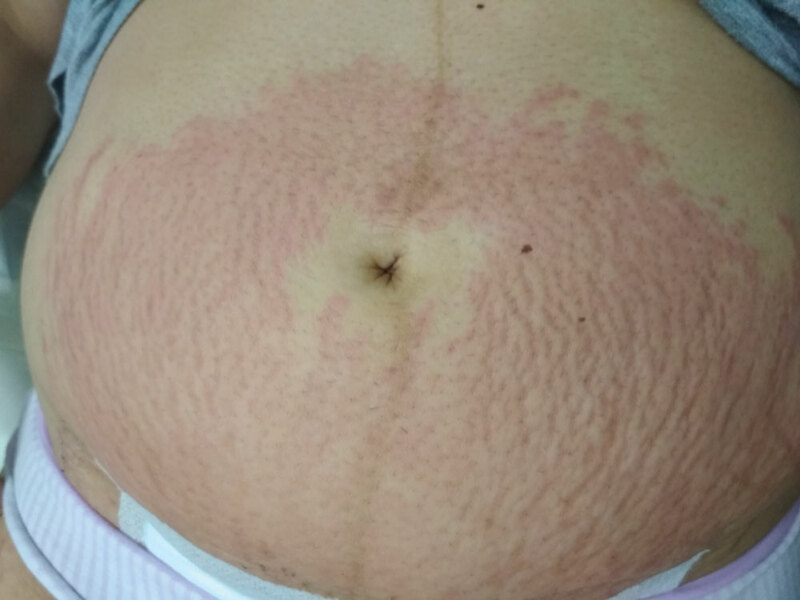 A 26-year-old primigravida with no relevant medical previous records, presented 5 days after a non complicated pregnancy and a C-section due to arrested labor, with an acute broad highly pruritic rash with coalescent papules and plaques affecting the abdominal wall - specially the striae (Figure 1) - arms and proximal tights (Figure 2 and Figure 3), with no blisters and sparing the umbilicus, suggesting PEP. She was medicated with ointment, topical fluticasone 0.5 mg/g once daily and 25 mg oral hydroxyzine at night. One week after she had evident recovery both in pruritus and cutaneous lesions (Figure 4 and Figure 5). Skin biopsy was not undertaken because the findings were highly characteristic, there was no suspicion of Pemphigoidg Gestationis and there was clinical improvement with steroid treatment. PEP is a very frequent entity during the last weeks of gestational. Unfortunately, and despite its high frequency is usually misdiagnosed with a allergic reaction or Urticaria. Even though its appearance may be quite exuberant, it is benign, self-limited and may be treated with topical steroids and oral anti-histaminic to improve pruritus. The main differential diagnosis is Pemphigoid Gestationis, which is much less common, but in contrast to PEP, it may be associated with fetal dismiss and thus requires more fetal and maternal surveillance. 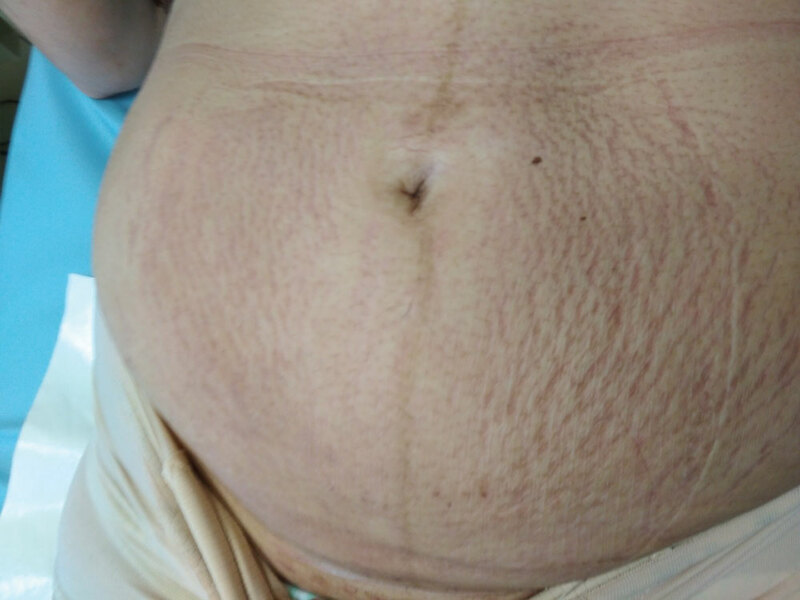 Our patient had the typical presentation of PEP, with papules and plaques on the abdominal wall, predominantly affecting the striae, extending to proximal arms and tights, sparing the umbilicus and with no blisters (these two would be characteristic findings of PG). When there is doubt, a skin biopsy confirms the diagnosis. In our case, we opted not to perform a skin biopsy because the findings were highly suggestive and there was clear clinical improvement. PEP is typical during the last weeks of gestation. There are anecdotal reports of PEP appearing only after delivery. 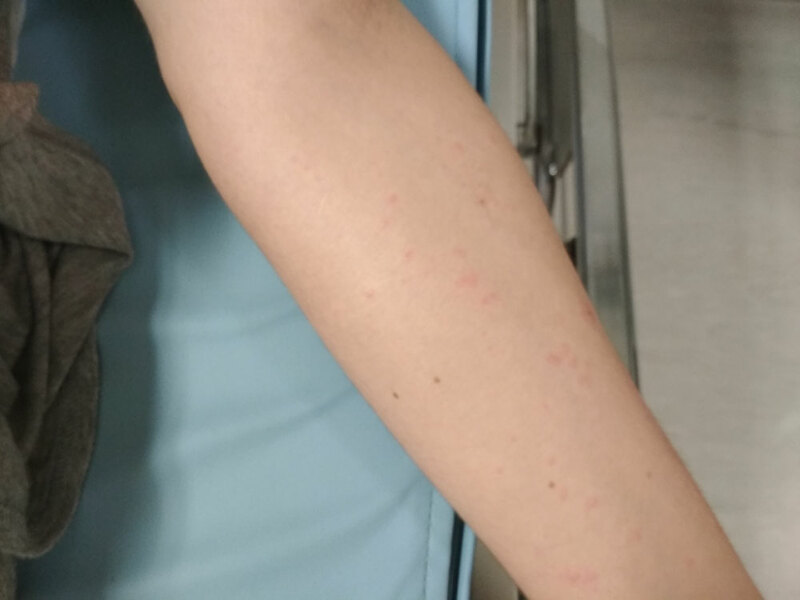 Our patient had this rash for the first time 5 days after delivery, which is quite rare, but the course of the disease was the same as during gestation. Polymorphic Eruption of Pregnancy is a benign and self-limited disorder associated with abdominal distension of late pregnancy. Multiple pregnancy, fetal macrossomia and hidramnios are risk factors for PEP, but this may occur in any pregnancy. It's very frequent even though most of the times misdiagnosed with an allergic reaction. Treatment with topical steroids and oral anti-histaminic may help improve symptoms and accelerate recovery. Even though PEP almost always occurs during late pregnancy, it may rarely present only few days after delivery, and it is expected to follow a similar course as during pregnancy. Lawley TJ, Hertz KC, Wade TR, Ackerman AB, Katz S (1979) Pruritic urticarial papules and plaques of pregnancy. JAMA 241: 1696-1699. Elling SV, McKenna P, Powell FC (2000) Pruritic urticarial papules and plaques of pregnancy in twin and triplet pregnancies. J Eur Acad Dermatology Venereol 14: 378-381. Caproni M, Giomi B, Berti S, Bianchi B, Fabbri P (2006) Relevance of cellular infiltrate and cytokines in polymorphic eruption of pregnancy (PEP). J Dermatol Sci 43: 67-69. Kwon EJ, Ntiamoah P, Shulman KJ (2013) The utility of C4d immunohistochemistry on formalin-fixed paraffin-embedded tissue in the distinction of polymorphic eruption of pregnancy from pemphigoid gestationis. Am J Dermatopathol 35: 787-791. Aronson IK, Bond S, Fiedler VC, Vomvouras S, Gruber D, et al. (1998) Pruritic urticarial papules and plaques of pregnancy: Clinical and immunopathologic observations in 57 patients. J Am Acad Dermatol 39: 933-939. Teixeira V, Coutinho I, Gameiro R, Vieira R, Gonçalo M (2013) Specific dermatoses of pregnancy. Acta Médica Port 26: 593-600. Brandão P, Sousa-Faria B, Marinho C, Vieira-Enes P, Melo A, et al. (2017) Polymorphic eruption of pregnancy: Review of literature. J Obstet Gynecol 37: 137-140. Lehrhoff S, Pomeranz MK (2013) Specific dermatoses of pregnancy and their treatment. Dermatol Ther 26: 274-284. Bechtel MA, Plotner A (2015) Dermatoses of pregnancy. 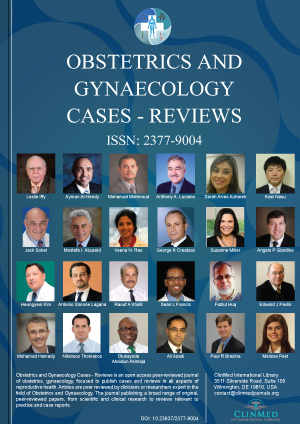 Clin Obstet Gynecol 58: 104-111. Kirkup ME, Dunnill MG (2002) Polymorphic eruption of pregnancy developing in the puerperium. Clin Exp Dermatol 27: 657-660.